Disclaimer: This is a sponsored post in partnership with New Balance and Meredith Productions. All words and opinions are 100% my own. As a mom and runner my number one concern is always comfort for my feet. After all they carry us around every day. It can be hard to find a shoe that looks good and offers the comfort that is needed to help carry us through the day. But who said you always have to give up looks for comfort. A few days ago I was introduced to the Fresh Foam Arishi by New Balance shoe and let me tell you that I'm not lying when I tell you that they haven't left my feet ever since. Overcast with Castlerock & Champagne Metallic) I was a little disappointed and no, It's not because I'm not a fan of the color it's just that as a mom my little one is always stepping on my shoe and therefor my shoes always get dirty and fast. With all the other things I end up doing, cleaning my shoes is the last thing on my mind - ha! Now putting that aside, when I put on the Arishi I immediately felt like I was rocking some amazing shoes but aside from looking very stylish, my feet were in heaven. When I started running one of the things that I learned about buying a proper shoe for your feet was that they had to offer proper support, be at least half an inch bigger, and lightweight enough that they didn't feel heavy at the end of the day. Well. the Fresh Foam Arishi by New Balance offer all of that. They are the newest shoe to come out for New Balance which offers ultra cushioning and are made of a lightweight and breathable material. They were made in mind for the women on the go. Fresh Foam Arishi is a running shoe but I'd personally recommend them for light running and not long distance or as a training shoe. They do have good cushioning enough to help you as you walk around for hours. I am always on the go and being that I'm a runner the only sneaker that I owned aside from Converse, were running shoes. My son has tried to help me find a good pair of shoes for walking and running around the city that never sleeps, with no luck. He'd given up, due to my eclectic style. Can you blame me for loving color, glitter and fun prints. The thing with that is my feet never matched the rest of my outfit and that annoyed some of my family members, after they saw my new Fresh Foam Arishi by New Balance everyone was happy to see a neutral shoe be added to my collection, that provides the necessary support and is not a colorful running shoe. It's been more than a week and the Arishi have not left my feet, I've taken them everywhere with me. Even the gym, they are great for working out but they've been even better when walking around all day. Oh, and they are intact for some reason unknown to me, my Foam Arishi are still clean and yes Valentina has stepped on them a few times. Overcast with Castlerock & Champagne Metallic and cost only $69.99. They are also available in standard or wide width. Which is great for those who have wide feet, including myself. My pair is medium width and a size 9. I usually wear a size 9.5 in other running shoes but these fit me just fine with a about half an inch to spare. Giving the feet space to breath when they expand after walking a lot. They are available at NewBalance.com or a store near you. I've talked so much about my Arishi and haven't stopped wearing them that my mom ended up getting herself a pair, not only that but we had some DSW coupons which made her order total only $45. They are on their way as I type this! We will be Arishi twins and can't wait for her feet to walk around comfortably. Follow New Balance on Twitter, Facebook and Instagram. Have you ever tried New Balance? 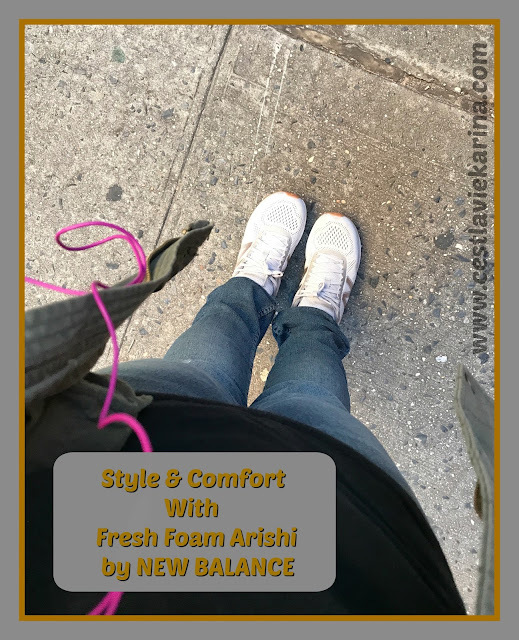 1 comment on "Style & Comfort with Fresh Foam Arishi by New Balance"